Have some fun this weekend !! Ohhhh, pink pretties!! 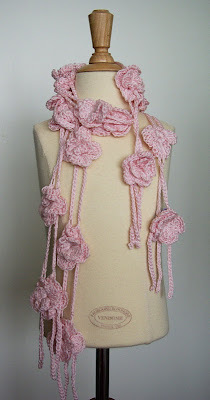 I'll have to show you a photo of the pink curly Q scarf my niece knitted me a couple of years ago! Have a wonderful weekend, sweet Nerina! Oh my what a beautiful share as always. I so love it when you share. You have such flare. Love it. I will have to pop over and see And So I Whisper. Her scarf is absolutely breathtaking. Hope you are well sweet friend. Have a gorgeous Pink Saturday and a wonderful weekend. OMG! 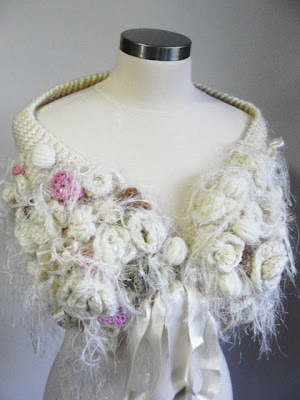 These pieces take knitting to new heights! Nerina..those scarves!!!! I could just wrap up in that first one all day! Oh how lovely and the creation in the first photo is stunning! I'll have to check out the lovely creative ladies you highlighted. Thank you for your visit and sweet words...you truly are a special lady and one I'm very glad to call friend! I've missed your posts and YOU, too. I am doing my best to get back in the swing of posting and reading the blogs that I love. Love the pictures in this post, especially the yarn in the glass. It just looks so pretty and inviting! I really love the knitting pinks you shared with me today. Happy Pink Saturday. Oh to see that level of detail again. Old age, indeed. Great stuff as usual, Lady. In need some pink yarn...I need my needles...I need to create! How inspiring! Nerina, your pinks are perfect for these days that have a chill in the air. I'm not a knitter, but I sure do love to wear handknit sweaters and scarves. Beautiful pinks! Love the knitting yarn AND those pink needles, too!